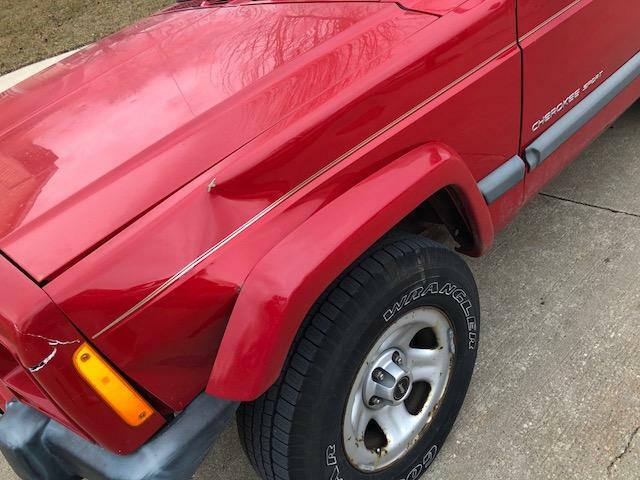 Teen backed into my Jeep! what can I do about this? Try replacing myself...Junk yard?? cost in a reasonable shop?? any advice would help! Looks like a fender and front grille replace. Any frame damage? Yea unless it has more damage the eye can see I would say fender, front clip unless your good with fiber glass, and maybe inner fender. JY your best bet and cheap will just have to repaint to match. New fenders online are not horrible in price but I would save and go used. Plenty of XJs around to take parts like that from. Check craigslist or offer up to see if anyone is selling color matching parts. Everything is pretty easy to replace with just a small amount of tools. 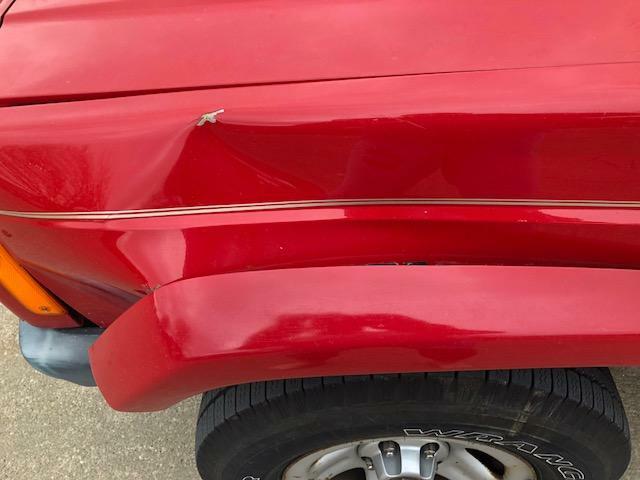 No other damage besides the dent....sorry for the novice questions...So if possible I should try to find the parts used ...Bumper / Quarter panel ?? What tools would I need to remove the damaged parts and use to replace??? If I took it somewhere what do you think it might cost for someone to do the labor if I got the parts? thanks so mush for any help! Do it yourself don't pay someone....few basic items like socket set specifically metric and then just remove the body bolts that will release your fender. Not sure on the damage of inner fender but you may be able to just pop that back out. If you want a real estimate of how much it would cost someone to repair that fender your better off taking it to a shop for apprasial. Each place will be different. Did you do any pre meassuring on the frame of the jeep to make sure nothing got bent? Impact area is high so I suspect you will be fine. Hardest part of the entire process will probably be lining the body panel back up using shims to ensure it is sits flush and properly. Other than that disassembly is not tough just take your time. Take photos to help with your process of remembering to put it back together. Or take notes! Thanks for the response!.. One more question ...Do you think someone looking to buy this in the next couple of years for a rebuild or a project Jeep would see this damage as a minus or a plus? I have loved this vehicle , but it is getting to the end of were I think me putting money into it will decrease the value to someone looking to work on it..It still has great interior... zero rust ..runs great ..Is that the right way to think about it? I think if you fix it and offer to be honest with your future seller they are going to take that into consideration and most likely understand and still purchase the vehicle. Your honesty and word will go a long way. If you decided to have it professionally rebuilt then save receipts and then someone can use that to verify the work performed. Sad to see you sell it but totally understand life changes and the need to do so sometimes. For someone such as myself that would not be a deal breaker. Even if I were to buy it as is. That's because I could easily fix it but that's not going to be the case for everyone out there. Assuming there is no uniframe damage of course. yes...that is what I thought ...I see someone buying this eventually to work on and rebuild not using for any everyday car....just curious knowing the interior is really good and clean and zero rust ..what kind of ball park price would you pay?.. Well I have not seen the vehicle in person so I couldn't even begin to give you a fair assessment. I know I paid $600 for my Jeep but of course if I were to rate the interior it was a 1-2 out of 10. Rust in floors, carpet soaked, interior trim marked up, dirty, excess screw holes in it, etc. headliner missing. Plus side I had a working CD player with speakers in the doors. For what I wanted my Jeep for it was perfect because I was stripping the interior anyhow. Slowly fixing some things but mine is suited for off roading mostly so the DD luxuries everyone else would need if you drive every day is not something I was concerened with. Mine though was running, no rust on body, no dents, but small holes on roof due to old roof rack OE type removed and Previous owner never fixed that. I would be throwing a odd # out there for your particular jeep. You definition of clean interior could be totally different then mine. You say it is clean and carpet is good but these Jeeps are prone to rust on the floors even if you can't tell. You wouldn't know until you pulled back carpet. Also, will depend on the location the Jeep is from and still currently. That is just to name a few things but I'm sorry I couldn't really give you face value to your XJ unless I see it. I could go by the KBB value of a private seller and compare to your asking price then start there. Once I look the vehicle over that is when I would offer you a price. For starters I see rust surface that is on your wheels which might indicate more surface rust underneath but the question would be how much and how bad. That fender again would not be a deal breaker for me. Cracked grill no biggy too it really doesn't look that bad but until you tear it down you will not know. 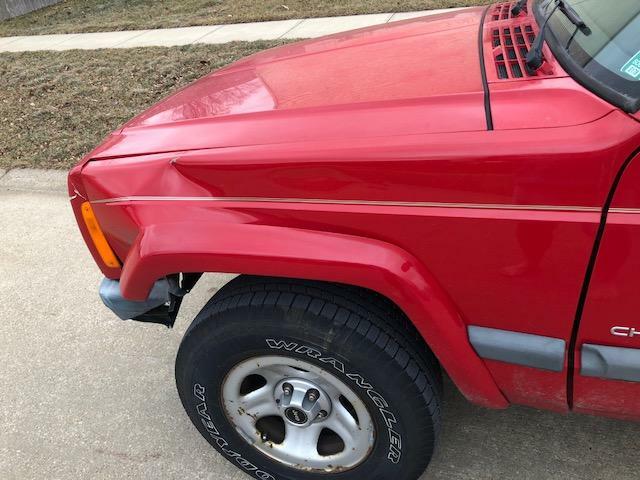 Puttin cherokee 2001 stock lift on a jeep cherokee 89?